Set in the 1960's this is the story of a compelling attraction between a divorced American Ex-marine and a Puerto Rican woman of unusual beauty. From bare fisted, bawdy house brawls, to racially tinged sailing escapades in the Virgin Islands, to passionate encounters in Old San Juan, Brad Fichton pursues the scintillating but elusive Mercedes Cordova. While followng the twists and turns of this intense love affair, the plot delves incisively into the complex world of Island politics, providing rare insights into the deep seated, emotional ambivalence Puerto Ricans feel over their relationship with the United States. The reader will come away with the pleasure of a rousing tale, plus a new understanding of the simmering nationalism and divided loyalties that fuel the current unrest on this detached and little understood part of America. Cosmetically classified as "The Commonwealth of Puerto Rico"--the island remains essentially an American colony, torn between strong economic dependence on the U.S. and equally strong longings for its own identity. How the main characters struggle to make sense and find love in this tangled, ploitical web makes for an interesting read that will instruct as well as entertain. Garry Hoyt is a yacht designer and writer, currently living in Newport, Rhode Island. He is the author of three books on sailing--Go For The Gold, Ready About and Go For The Green, as well as numerous articles in the marine magazines. Hoyt was the founder of Freedom Yachts in 1976 and his "Escape" designs have introduced many new sailors to the sport. He was also an Olympic sailor and has won the Sunfish World Championship, along with a wide variety of other sailing titles. In January 2000 he was named by Sail Magazine as one of the 30 most influential sailors of the past 30 years. In his earlier career in advertising, Garry lived for 25 years in San Juan, Puerto RIco, where his two sons were born. During this period he traveled extensively to Latin America and the Far East, as area manager for Young & Rubicam. 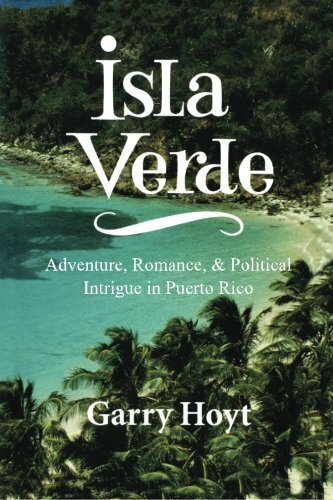 This experience, together with his acquired knowledge of Spanish, has given Hoyt a unique perspective into the complicated world of Latin politics, especially the events in Puerto Rico, where he was a close-up observer. A 1952 graduate of Colgate University, where he majored in English Literature, Hoyt also received a degree from the Thunderbird School of International Management. He served as a Lieutenant J.G. in the U.S. Coast Guard with Search and Rescue duties in Florida and the Caribbean.